The Comfort Inn is huge! It looks more like a hotel instead of a motel. 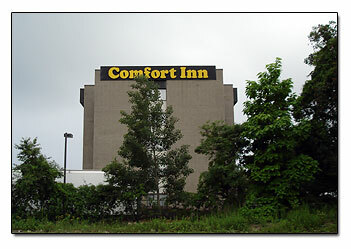 We were rather impressed by how easy it was to find the Comfort Inn. Not only that but their is a wonderful restaurant right in front of it called the Irish Pub and Steakhouse, or something like that. 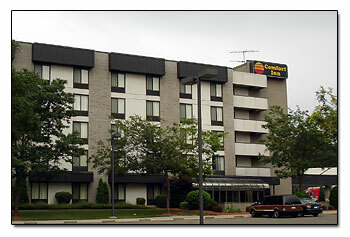 This Comfort Inn is only fifteen minutes to downtown New Haven. University of New Haven, Coliseum, Peabody Museum, Southern Connecticut State University. Palace, Shakespeare Theaters El Wharf, golf, and Milford beaches are just minutes away. Within walking distance to shops and restaurants. Milford, Connecticut is approximately 1 hour away from New York City, NY. From New York, Exit 40 off of Interstate 95, make a right at the end of the ramp, and go several blocks. You'll see it.